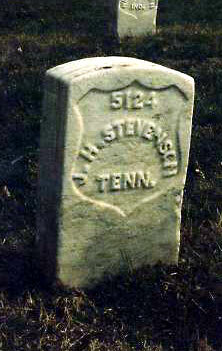 Joseph Stephenson was born in 1836 in Morgan Co., AL. One record indicates he died November 17, 1862 while another states December 27, 1862. Joseph married Rachel Blevens (born 1841, died April 21, 1904) daughter of James and Rachel Nesmith Blevins. Children of Joseph and Rachel were: Joseph Hamilton (born November 19, 1862 in Winston Co., AL, died February 23, 1942 in Winston Co., AL) married Sarah Lou Vestie Ann Ford (born July 1866, died January 15, 1899); and Mary Jane Stephenson (born January 21, 1861 died February 15, 1903) married Samuel J. Calvert (born June 13, 1857, died March 27, 1921). After Joseph's death, Rachel married John R. Campbell, the widower of her sister, Jane Catherine Blevins (born 1843, died March 6, 1863). John R. Campbell was also with the 1st Alabama Cavalry. Between them they raised Joseph's two children, Catherine's three children, and 5 children together. Joseph's parents were Adam K. Stephenson (born 1784 in SC, died about 1860 in Winston Co. AL) and Easter Alexander (born 1785 in TN, died about 1788 in Winston Co). Easter's father was Jeremiah Alexander (born July 4, 1763 in MD and died January 26, 1847 in Walker Co., AL) who was a Revolutionary War soldier. Other children of Jeremiah Alexander were: Letisha, born 1800 in TN, married Martin O'Rear, died 1876 in Walker Co., AL; Abagail, married James Randolph; John; and Martha, married July 18, 1822 in Morgan Co., AL to David H. Inman.